Targeted Overlays allow you to display an image or HTML to site visitors when they enter or leave Permutive segments. 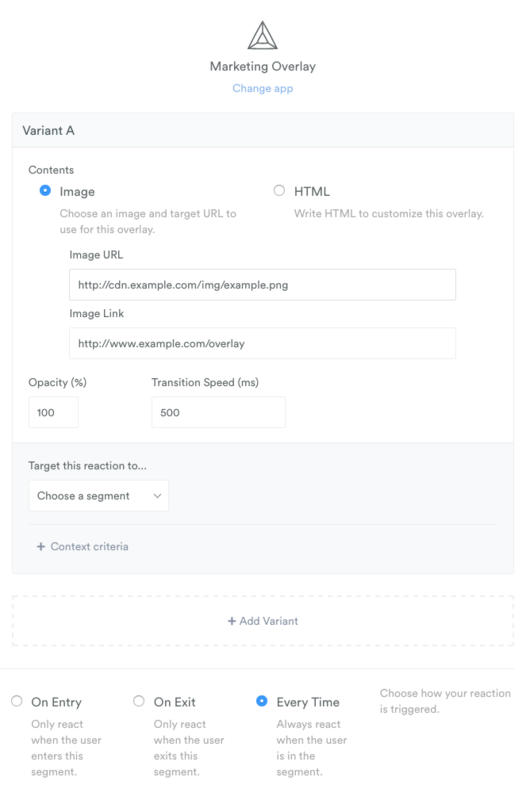 Image overlays show an image, which when clicked takes the user to a URL of your choice. To create an Image Overlay, you need to have a URL for an image you've hosted somewhere, and the link you wish the image to follow. It's very simple to set up. Image Link: The URL you want the user to go to, when they click the overlay. Opacity: How transparent you want the background behind the overlay to be. Transition Speed: The time you want it to take for the overlay to fade in and out. On Entry / On Exit / Every Time: When you want the overlay to be displayed. On entry to a segment, when a user exits a segment, or every time they visit a page while in that segment. Code: The code you want to be included inside the overlay. Although it is HTML that will be shown, you can also include Style tags, or Script tags that will also be run when the overlay shows. Variants: Covered in Reporting below. When using Targeted Overlays, you can track impressions and conversions on the overlays. Conversions mean clicks on the overlay. 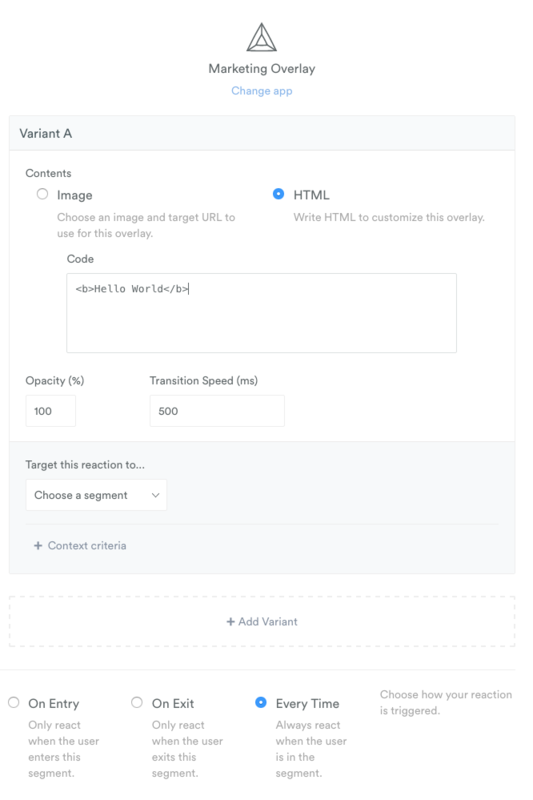 If you want to test an overlay to different audiences, or different overlay content you can set up multiple variants. These variants will be tracked in Permutive. You can set up a variant by clicking '+ Add Variant' then setting up your variant in the same way as you set up your initial overlay.